It is basically possible to design a residential building according to criteria similar to those of a functional building and with that to plan the same functionality. The building installations usually seen up to now have for years been based on the distribution and switching of electrical energy. This method is long outdated. Private clients still tend to derive their requirements and expectations regarding electrical installations from their experiences with familiar installation technology. modern installations have changed dramatically. During a consultation, the private client is largely unaware of the range of possibilities and opportunities for future extension that are offered by an EIB installation. This information must be passed onto him as clearly as possible without overloading him with unnecessary details. He must be told that it is easily possible to expand or complete his EIB installation at a later date. Good and comprehensive﻿ consultation is the best foundation for follow-on contracts for the completion and extension of carefully planned EIB systems. Incomplete or inadequate consultation can quickly turn an initially satisfied customer into a very unsatisfied customer, if he later learns that his investment in a bus installation cannot be fully exploited. It must be made clear however, that the answers themselves do not define the installation. They only serve to analyse the customer’s requirements as a basis for determining the feasibility. Some of the questions hint at technical solutions that will only be available on the market in the months or years to come. They do however play a role in the suggested solutions, as it is possible to take them into consideration for implementation at a later date (preparatory cabling). Completion of this questionnaire essentially represents the specifications. An offer can then be made on the basis of this document, using the “ZVEH calculation aid”. Project design begins once the contract is awarded. The private customer is building a one-family house with garden and garage on a remote site. There are distinct demands on security. Value is placed on ways to save energy and costs. Particular demands have been made regarding comfort. Some of the wishes cannot yet be technically realised, which means that a system planned with foresight is extremely important for follow-on contracts. Subsequent extensions to the system and functionality must be taken into consideration. A few of the possibilities mentioned in the questionnaire are viewed as critical; further information and more detailed explanations could extend the project and offer approaches to a service contract. 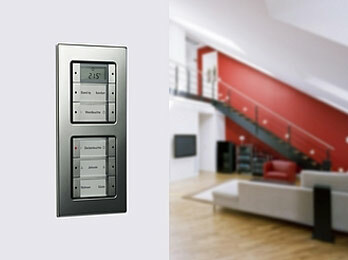 Within the house, switching points should be located near the doors as well as in the sleeping and seating areas. Lighting control with movement detectors should also be planned for the garden and access paths. Security lighting should be incorporated. The simulation of an “occupied house” by adjustable sequences is required. The lighting control should be integrated into the Home-Assistant. Switchable sockets should be provided for the exterior areas, kitchen, workroom and bedrooms. For the simulation of an “occupied house”, switchable sockets should be planned for lights. The switching status of the sockets should be represented in the HomeAssistant. Single room temperature control should be included, which in addition to manual intervention also allows monitoring and control via a HomeAssistant. The radiators should be switched off when the windows are open. Remote control and remote signalling should be possible for the heating system. Reporting to a customer services department should be planned for a later date. The heating system should be adapted to the requirements in a way that saves energy and costs. It should also be possible to monitor it from a central position; i.e. it should be connected to the EIB and integrated into the HomeAssistant. The hot water supply should be investigated separately, as a combination of gas, electricity and perhaps at a later date solar energy must be taken into account. The blinds should be motorised and must react accordingly in adverse weather conditions. In addition to manual operating possibilities located near to the windows, it should also be possible to control and monitor them from a central position. In rooms subject to dazzling sunlight, it should also be possible to adjust the angle of the slats. The open or closed status should be centrally displayed. They should be incorporated into a security system. In addition to manual operating possibilities, awnings installed on the patio should be automatically retracted in strong wind or rain. It should also be possible to use them to influence the temperature of the shaded room. They should also be used to simulate an “occupied house” and allow the possibility of control from a central position. The closed status of the windows should be monitored and displayed centrally. Any tampering should be detected and incorporated into a security system. Motor-driven operation should be included as a possibility for use at a later date. The closed status of the house doors and garden gates is to be incorporated into a security system. Additional visual monitoring is also desired. For extra safety, the water and gas supplies should be monitored and integrated into a security system. As this is not yet on the market, a provisional installation must be planned. As a prerequisite for measures to save energy and costs, the meter readings and running costs should be displayed. The installation should be designed for the future implementation of remote meter reading. Regarding new purchases, interest lies in the use of devices with a bus connection. It is therefore necessary to plan, at least provisionally, the corresponding number of communication sockets. In the garden and along the path to the house there should be lighting and movement detectors and these should be integrated into a general security system. It should be possible to operate a sprinkler system depending on the dampness of the ground. Measures should be included to increase security. This must include interior and exterior lighting, the windows, blinds and the entrance doors. Monitoring at the HomeAssistant with remote signalling possibilities should be planned. It should be possible to trigger emergency and help calls, quickly and easily. A device, which is capable of receiving television signals in addition to allowing the simple operation and control of the household installations, should be fitted in the kitchen (HomeAssistant). Cultivation of a winter garden with shadowing and utilisation of the heat energy that is produced in the transitional period. Lighting in the living area. Isolation of the bedrooms to avoid electromagnetic fields. Connection to service stations for the various devices. Construction of a garden pond with the ability to monitor the circulating pump and maintain a constant level. Installation of a solar panel and integration into the existing hot water supply. Although in comparison with a large functional building, we are dealing with a much clearer installation here, a installation should be planned. This has as much to do with the variety of functions desired as well as with the high probability of later expansion. A separate line should be provided for each floor to ensure simple and clear structuring. Because this example deals with a new project, the project design is carried out with ETS 3. The result is an extensive set of detailed lists. For projects where there is a high probability of expansion or modification within subsequent years, other documents should be provided in addition to the lists. Results of the project design stage form the foundation for all subsequent steps of the installation, commissioning and maintenance, and with that of course for all future expansion. Reference is made to the documents or wiring diagrams in accordance with the standards of the EN 61082 or DIN 40719 series, in particular to the bus devices and bus lines with physical and group addresses that are marked on the ground plan (see Fig. 1). The logic diagram indicates the bus devices and their physical addresses as well as allocation to the lines. If the complexity of the project demands, it may also be necessary to draw up a functional diagram. This saves a considerable amount of time during subsequent expansions or modifications. If you also draw the parameter block for each of the bus devices, you are left with an excellent and very clear set of documents. The HomeAssistant necessary to implement this example system demands exact adherence to the rules of ETS 3 and to the design guidelines. Of particular importance is the entry of room structure, completion of the key fields and the addition of extra groups (so-called single actuator groups). Adherence to these guidelines is important because the terms and names for the rooms and devices are derived from this data and appear in the operating menus of the HomeAssistant, allowing the end user to recognise his own individual system. The database created with ETS 3 is transferred into the HomeAssistant using the HomeAssistant Tool Software (HTS), which is included in the scope of supply.